From the Baldwin County Courthouse, go east on Hancock St. one block. Turn right (south) on Wayne St., which becomes Business 441S. Follow Business 441S for approximately 4 miles to the intersection of Hwys 441 and 243. At this intersection, 441S goes left and highway 243 (the Gordon Highway) goes straight. Go straight and follow 243 south. Proceed 4.6 miles to the cemetery on the left. 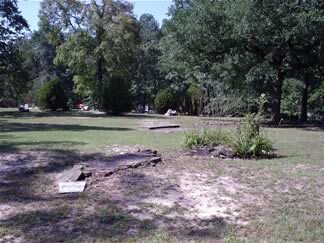 The cemetery was surveyed based on side (north or south) of the driveway. (The north side is nearest Hwy 243 and to the left of the driveway.) Within each side, the graves were surveyed in rows, starting at the far back (southeastern part) of the side. My trust is in God. We will always love you. Tacha & Torey "P"
m. Rev. Leroy Allen Jun 29, 1979. Heavy paint on pillow makes death date nearly impossible to read. Handwritten. Unreadable. A middle or last name may be William or Clay. Adult slab. Possible birth Feb 5. 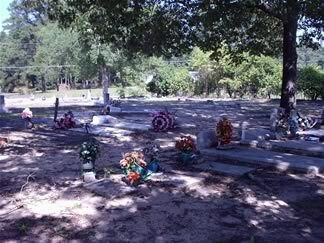 New grave as of Sept 23, 2006.